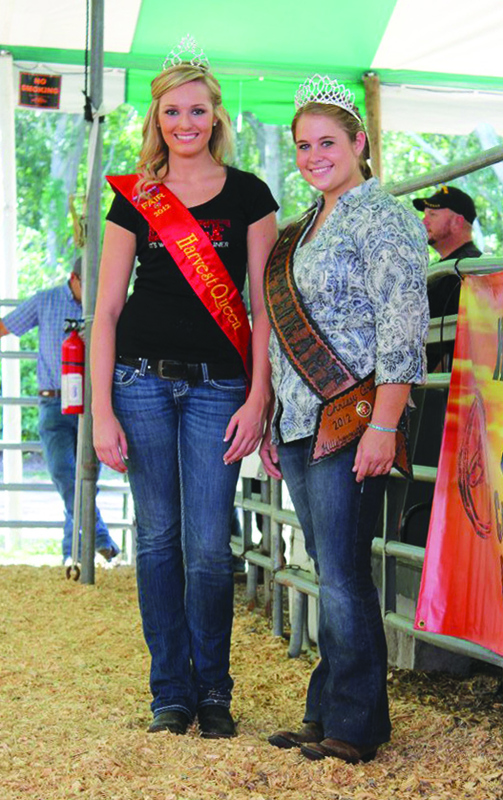 The 2012 Harvest Queen, Kallee Cook, and Hillsborough County Cattlemen’s Sweetheart, Chrissy Grimmer, pose for a photo opportunity at last year’s county fair. Fall brings cooler weather, pumpkin carving and candy collecting, but it also brings the much-anticipated 20th annual Hillsborough County Fair. Located at 215 Sydney Washer Rd., the fair can be easy to miss but worth the find. This year the fair runs from Wednesday, October 16 through Sunday, October 20 and as always offers free parking. Tickets cost $7 for adults, $5 for students six-years-old through high school, $4 for seniors over 60 and children five or younger are free. Whether looking to enjoy the entertainment or compete in one of the events, the fair offers something for children and adults of all ages. One of the main draws of the fair is its ranch rodeo which runs at 7 p.m. Friday, October 18 and Saturday, October 19 this year in its 1,800-seat outdoor arena. The rodeo includes bronc riding, branding and mutton busting for the children. Advance tickets can be purchased for $10 and includes entry to the fair. Other entertainment includes Heidi Herriott’s Family Fun Circus, Robinson’s Racing Pigs, a firefighter show geared toward allowing children to fulfill their dream of becoming a firefighter and plenty of fair rides like the Tilt-a-Whirl and Ferris wheel provided by Arnold’s Amusement’s and delicious fair food like deep fried Oreos and sausage fries. There are a slew of competitions for patrons to participate in and enjoy; such as the battle of the bands and the chili cook off. For artistic individuals, there is a hay bale decorating contest, recycled yard art, family living arts and crafts like baking and sewing and visual arts like photography and painting competitions. The horticulture competition and livestock shows appeal to the animal lover in everyone. For more information about other competitions or how to enter, please visit www.hillsboroughcountyfair.com or call 737-3247.